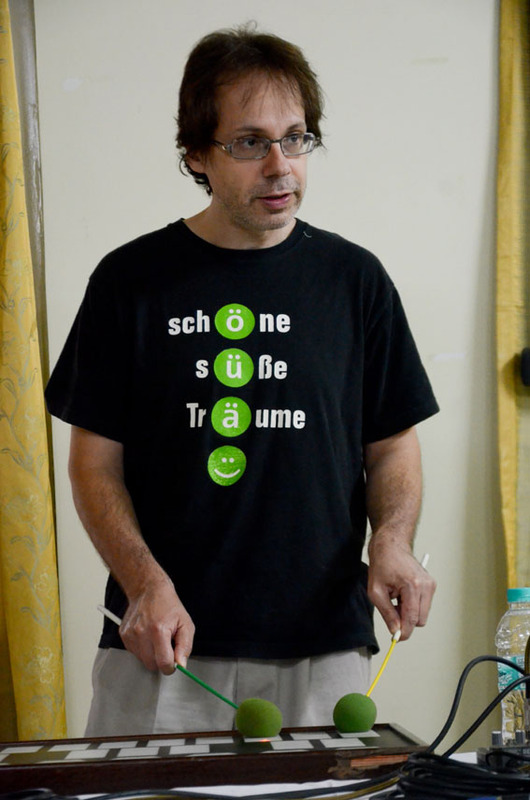 Acclaimed award winning Austrian composer, musician and percussionist Lukas Ligeti was in Nagaland from the 14th to the 18th February 2012, as part of his India tour. The north east leg of his tour was a collaboration between the Austrian Cultural Forum, the Dept of Art and Culture, Government of Nagaland and Hope Centre for Excellence, Dimapur, Nagaland. 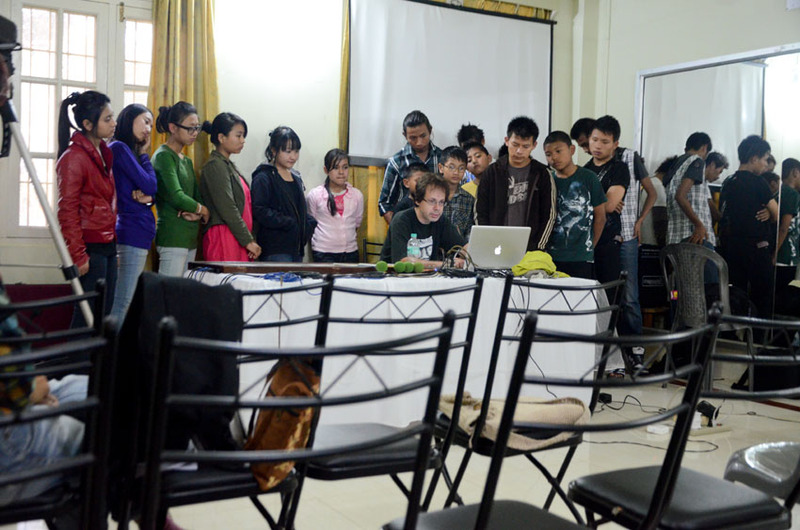 Lukas conducted workshops with music students, teachers and music lovers at Hope Centre in Dimapur and demonstrated the ‘Marimba lumina’. The Marimba lumina, is an electronic percussion instrument designed by the legendary engineer Don Buchla. This instrument combines African and Western marimba playing styles and also examines how electronics can change percussion technique and how a mixer can be played as a musical instrument. During the workshop/demonstration, Lukas interacted with local musicians who observed up close the various intricacies of this unique instrument. After the series of workshops which was very well received, Lukas ended his tour with a concert on the 18th evening. Accompanied by South African Flautist Ilke Alexander, Lukas showed his versatility by performing with young artistes like 12-year old violinist Sophia Mozhui, classical guitarist Jeevan Ingti and folk artist Hojevi Cappo. Young, upcoming 14-year old pianist Rugoser Liegise and accomplished neo–classical male voice Zowe Madrigal also performed at the concert. Before the performance the Austrian Composer and percussionist said that he played “no particular genre but just my own music”. He said that traditional music around the world inspires him. His improvised fusion of music with local Naga folk artiste Hojevi Cappo on the traditional flute was in typical Ligeti fashion. Treating music lovers and aficionados alike to the intricacy and poetry only an exotic music device like the synthesizer, the Marimba Lumina can produce, the composer displayed its full range to a packed house at Niathu’s Resort. Lukas Ligeti, for the uninitiated, has been living and successfully making/teaching music in New York City. He has been composing for leading orchestras and contemporary music ensembles in North America and Europe, including the prestigious Wiener Konzerthaus (Vienna Concert Hall), the Vienna Festival, the Radio symphony Orchestra Vienna, Wien Modern Festival. Last year, he wrote a concert for the instrument “Marimba Lumina” and orchestra, which premiered at Carnegie Hall New York with the American Composers Orchestra and conductor Dennis Russel Davies. His music is a mixture of composed and improvised to elements. While his music does not represent a clear cultural heritage, it has a multitude of influences and places coming together in coherent unity. His music ranges from the thorough composed to the free improvised. He composes for contemporary music groups, orchestras and soloists, writes for and performs for jazz musicians and collaborates with traditional musicians especially in Africa. He has worked on a combination of West African traditional music and electronics.